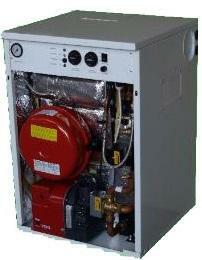 The Combi Plus CC4 oil boiler is a condensing unit which delivers an A rated efficiency level of 92%. It has been designed and manufactured by Mistral as a floor standing unit that is able to fit underneath a standard kitchen worktop. It’s finished in a high quality white casing and is also available as a non-condensing model and for either indoor or outdoor installation. This unit has an output rating of 41kW to suit the larger home’s heating demands but is also available in range of other options from 15kW. As a Combi boiler it will provide your hot water and heating on demand directly from the mains water supply. It’s an all-in-one unit which means you don't need to have bulky tanks or a storage cylinder which is a great space saver. The multi directional flue outlet option allows a quick installation that can save you time and money when used together with pre punched pipe entry points on both the sides and back. It has a removable front casing the permits easy access for commissioning and future servicing. This boiler includes a 5 year warranty so you can trust that this boiler is not going to let you down.